In 1896 reports emerged of a marvelous clock, which had stood, a mute spectator, on the mantelpiece of a Durham coal miner’s cottage until it suddenly began to move and to “talk.” The narrator, one John Lord, tells the striking story. Remarkable Experience of a Durham Miner—A Talking Clock! I will attempt an answer based upon the remarkable experience of a Durham miner. The facts admit of demonstration daily—almost hourly. In the possession of this Durham miner is a disused French clock, of the old-fashioned shape, a wood frame encasing very ordinary arrangement of wheels, and a door of glass in the style of many years ago. Perhaps when the clock was new it would be priced at from 6s. to 7s. 6d., and it was a wedding present to the miner’s wife. For several years past the clock has been useless as a timekeeper. It is utterly out of order now—without pendulum or suspending wire. It has otherwise been injured, and is kept merely as an ornament on the chimney piece of the miner’s downstairs room, solely out of regard for the associations of the donor’s name with the occasion of the gift. The miner’s wife has been very hard of belief in Spiritualism, almost as she is, unfortunately, of hearing. She suffers very much on account of her inability to hear ordinary conversation, and this fact has a close connection with the performances of the old clock. I am informed that it is six months since the wife of this miner had her attention drawn to the old timepiece. As she stood over the fire attending to the cooking or other household duties, she imagined she heard the clock ticking away, and, watching the fingers on the face, she saw that the long finger undoubtedly moved. She knew quite well that the clock had not been wound up, that the pendulum was off, and that the clock as a clock would not go. She asked it questions, and, listening attentively, she received answers, according to the common code of one for ‘no,’ two for ‘doubtful,’ and three for ‘yes.’ This proved to her sceptical mind that there was more in the subject of Spiritualism than either her husband or any other individual had been able to advance to her satisfaction. Being a woman of shrewd common-sense, she put the clock to a test. She put some very practical questions to it, and received answers which, on her husband’s return to his home from his work, proved correct in every detail. In course of time the clock has been educated to communicate with the husband in a very peculiar way. His duties require him to be down the mine an hour or more in advance of the miners who have to labour in that portion of the mine under his supervision; and it has become quite a custom with him to pay strict attention to the clock when he is preparing, in the very small hours of the morning, to descend the mine for his usual round of inspection. If the clock has anything of importance to announce the number of ticks is given as arranged for in the miner’s code. He will then say, ‘Do you want to tell me something?’ Three ticks, ‘Yes.’ ‘Will all be right to-day?’ According to the answer the conversation proceeds. On one occasion the answer came, one tick, ‘No.’ ‘What will be wrong—something in the men’s workings?’ Three ticks, ‘Yes.’ ‘Well,’ says the miner, ‘I’ll call the numbers of the workings under me, and then you can tell me which.’ One, ‘No’; two, ‘No’; three, ‘No’; four, ‘No’; five, ‘Yes!’ The miner went his rounds, and was most particular about No. 5 locality. He saw that there would be no cause for alarm if he put some props and a sleeper in certain positions under a large ‘horseback’ of mineral, which appeared to be liable to come down if the customary ‘shot-firing’ affected it. But he also told the men working there to be very careful and not neglect a certain precautionary measure which he pointed out to them, and which could not be taken till they had gone some distance through with their work. The clock had told him that no one would be killed, but that someone would be injured. The inspection had been so carefully made at this place, No. 5, that he was sure if they put an extra prop in before they cleared beyond a place he pointed out, there would be very little probability of harm coming to them. Having given this earnest caution, his duty was ended. His men having all got to work, he was then at liberty to wend his way home to his bed and rest. At No. 5 all went well for an hour or two. One of the men felt inclined to do just a certain bit more before putting in the prop, which his own good sense told him was needful, even though no danger seemed very immanent; but without the slightest warning a small portion of the roof fell down, and with all his presence of mind about him, and the caution given so very pointedly by the inspector fresh in his memory, a piece of the roof caught his shoulder and grazed the flesh from the shoulder to his hand. Though not seriously injured, he had time while he had to be off work till his injury got well again, to ruminate on the foolishness of not acting on his inspector’s advice sooner. On another occasion the clock, by the code adopted, advised the inspector not to fire a single shot, on a certain day. He did not do so. The following day, from the opposite workings to his, a hole was bored through the coal, and had shots been fired on the previous day, the thin coal might have been blown down upon the men working behind it; these men having to obtain access to their working places in another portion of the mine. Here, again, the clock was right, and as it was obeyed no injury resulted. Had the usual routine been followed, and shot-firing been done, three or four miners might have been buried under coals blown down by concussion. The nearness of these men to the workings of the owner of this clock was not suspected by him. He may have known they were progressing to the portion of the mine he was employed in, but not calculated to be so close for a day or two ; and had the clock not cautioned him he would have gone through the usual course of shot-firing. How does the clock obtain knowledge such as this and use it for so beneficent a purpose? The clock, by ticks, spells out the name of the person controlling it. The ticks are produced by the flat steel spring on which the pendulum wire was formerly suspended. The works of the clock are put in motion by the operation of this spring and the motion given to the escapement wheel. The movement can be seen going on even when the ticks are not loud enough to be heard clearly. The clock communicates wherever placed in the miner’s house; talks with the baby—a child about two years old; answers anyone in the house; and approves of conversation going on in the ordinary way at table, even if not specially addressed to it. The name of the person who most often controls is that of a former working mate of the owner of the clock. He is doing all the good he can by the exercise of what foresight he is gifted with ‘beyond the veil,’ and his friend in the flesh says he has never found him at fault yet! There is no varnish upon this narrative, no veneer, no polish; it is a plain story and true. To-day I have been fortunate enough to pay a visit to the cottage of this miner, handled the clock, conversed with it, and seen how it communicates intelligence; and I challenge any scientist to disparage my story or explain it away. The miner, his wife, and their baby girl are all mediums; and the clock is a medium, for it goes on whoever is standing by. When friends have been sitting at table, the clock has been ticking and the spirit friends have been walking about the bedroom floor overhead—heard by all present. I supply to you, Mr. Editor, the name of the owner of the clock for your own satisfaction, and I assure you I am perfectly certain no contrivance is possible by which this clock can be made to work as it does, except the true contrivance I claim for it. The clock was taken possession of a little while ago by a person not well disposed to Spiritualism. He deliberately injured it, to the best of his ability, short of smashing it altogether; and for about two weeks no sound came from it. Then it began to communicate again and has continued. The story generated much interest in the pages of Light and Mr. E.T. Nisbet of the Society for Psychic Research came to call and, to hear Mr Lord tell it, took the clock to a clockmaker, completely ruining any chance of replicating the clock’s communications by allowing the clock to be oiled and adjusted. To read Mr Nisbet’s negative report, called “An Exposure,” go to page 33 at this link. And now as to the clock. It was in a very sticky condition, and first made itself interesting to the miner’s wife. Her version was circumstantial to me. She has had many things through it which have been impossible to ascribe to collusion. She and her child consider that the clock has told them many wonderful things. Let me relate one. On a certain occasion mother and baby were amusing themselves by conversing with the clock while the father was down the pit at his work. Mother said to her baby, ‘Ask “Beattie” to tell dada to bring Lina a rosy apple.’ The father on arriving home presented baby with a rosy apple, and told his wife that ‘Beattie ‘ had told him, when at work, to take baby ‘a rosy apple.’ This story is upon the authority of the mother. No possible collusion existed here. Here the simple pathos of this incident, without motive to deceive any person, is self-evident. Now for the reverse side of this ‘clock story.’ Your account caused inquiry to be made, and an interview was sought at the instance of the Society for Psychical Research. The interview was granted. The clock was taken away by consent, and was returned in about two days, but not in the condition in which it was when borrowed from the miner’s wife. When shown to me some of the parts were loose, and at the bottom of the case. The works had been oiled. No part of the old works was missing, or broken, but the entire conditions had been changed. The spring in the clock was slackened to its utmost extent. These altered conditions were not such as we should consider proper tests. The clock was, if you will admit the comparison, as if all the vocal organs of its throat had been relaxed. It had no voice. A certain amount of tension in the spring was needful, for producing motion on the pendulum suspender, through the escapement wheel. I was assured that it had not been wound up for years. The key, in fact, has been lost for years. Of course other keys could be had, but the miner’s wife states positively that none ever was used to her knowledge. Removal to other conditions ; and subjection to the oiling process; and removal of parts of the workings and the alteration of other parts may not have conduced to the elucidation of phenomena such as reported to you in my previous letter. 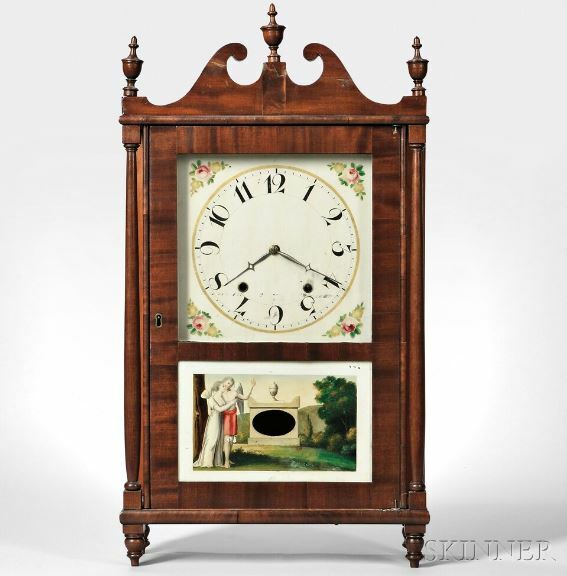 If removal from its normal conditions was not preventative of manifestations, then it was a wonderful clock, certainly! We have heard of musical boxes being wound up without visible means. Then why think it wonderful that an old clock-spring should be manipulated by unseen hands? Despite defending the honesty of the miner’s wife and the authenticity of the clock’s communications, Lord discovered some unsavory information about the miner himself, who was a local amateur medium. I have myself proved him unreliable, and have the most positive assurance needful that when he has given some séances for materialisation he has provided himself with white raiment to simulate spirit drapery! I enclose for your private examination a piece off that which he assumed at one séance, where he was grabbed; and with a piece of this fabric there was also cut away a piece of his body underclothing. On this account, and on account of the effrontery with which he poses as an advocate of the adoption of spiritual-wife theory, in regard to what he calls his séance-secretaryship, I denounce him as unworthy to pose as a representative of pure Spiritualism. I have nothing to recall regarding the narration of what the clock has done to interest the wife and child of this person. My animadversions are spent upon the phase of this miner’s ‘Materialisation phenomena.’ I adopted a most friendly attitude towards him, and maintained this attitude for many months (as you know, Mr. Editor), and now I must disassociate myself from him. He has been the medium for undoubted and stringently tested phenomena, but for the reasons I have given, I am compelled to advise all self-respecting people to leave him severely alone. I do not shirk the responsibility of tendering this advice to all searchers after truth. P.S.—I was informed to-night by a gentleman interested in this miner’s clock (really it belongs to the wife of the miner), that after having stood nearly three weeks without any noticeable movement, it has again resumed its signalling. The clock was placed in its old position, and, in as nearly as could be imagined, its old condition, and remained so till a day or two ago, when, to the glad surprise of its owner and her infant daughter, it began to make signals again. I do not suppose the mother and child are self-deceived. The inference is that the clock received merely temporary influence antagonistic to manifestations of intelligent control. The clock has been left alone by the miner himself: then how must we explain the silence which has continued for nearly three weeks? The conclusion must be that the silence and the signalling do not depend upon the heat or light to which the clock is conditioned in its place on the mantel-shelf. These conditions of heat and light have ruled for nearly three weeks of silence. The conditions are the same, now that signalling begins anew. I leave the facts as related by the wife, whom I would never believe capable of practising self-deception, or attempting to deceive others.—J. L.
The spiritual-wife theory, while espousing elevated sentiments about love being stronger than death and spiritual affinity continuing beyond the grave, might, in the wrong hands, degenerate into something like “free love,” something shunned by many respectable Spiritualists. Mr Lord not only condemned the miner as a fraudulent medium, challenging him to prove his powers in a controlled test, but called him a liar and advised all self-respecting Spiritualists to shun him. We are, unfortunately, handicapped in our search for the miscreant’s name: Mr Lord never gives us more than his initial: “G” as a clue to his identity. Mr Lord and other correspondents continued to complain bitterly of the meddling representative of the Society for Psychical Research. There is no charge brought against this Honorary Associate of injuring the clock; all that I have to say about it is that which appears in your last issue. The clock goes on signalling intermittently yet, after nearly three weeks of rest…. The clock maintains its well-earned repute for responses to intelligent questions. Does it not strike you as remarkable, the sharpness of this Honorary Associate, when he can discover sufficient force in the light from a suspended paraffin oil lamp to produce motion by radiation upon the wire suspended behind a clock face, some four feet away, upon an elevated position on the cottage mantelpiece? Professor Crookes’ radiometer is not in it at all! ‘Oh, but the heat from a large fire under the mantelpiece must soften the stiff grease on the wheels of the dirty clock!’ Heat, in the circumstances, goes up the chimney, or radiates from the fire. To get to the clock with any special effect, it must turn an angle. If this method of ‘Research’ accomplishes what this society aims at, we need not worry. This Honorary Associate was evidently thoughtful and kindly disposed towards me, at any rate; for he was bent upon bringing his own clock-mender to explain the workings to me! It is now nearly fifty years since I took up amateur clock-repairing; and I have had quite forty years’ acquaintanceship with intricate machinery of one kind or another, and therefore if I claim to know a bit about mechanics, I may be excused a smile at the innocent anxiety this Honorary Associate evinced to show me what he had found out. To sum up this friend’s wonderful discovery—it is that heat and light cause the clock to work. But he does not tell us what causes the clock, in the same conditions, to hesitate, and stop working. It is curious how firmly Mr Lord defends the clock’s honor and trusts the miner’s wife testimony, even though both he and Mr Nisbet noted her extreme deafness, which surely presented a difficulty when interpreting the clock’s ticks and tocks, unless she was watching the hands give answers in horological sign language. I can find no subsequent account of the clock’s career after April of 1897. I also know nothing about the workings of antique clocks and how they might stop and start without rhyme or reason, so the vagaries of the mediumistic clock might merely have been standard operating procedure for clocks of the period. Five years since I was at my place with my family in Woodruff county, near Augusta, Arkansas. My wife’s health had been feeble for a long time. The physicians had told me, before we went over there, that she might die in twenty-four hours. Her health was partially restored after a few months residence there. She was, however, taken with her old disease, and after a few days’ illness she died. On the mantel in her room was an old clock which had not run or struck for years, only once, which was the day before she died. A little over a year afterward, a noble boy of about four years, named after Robert E. Lee, was taken sick, lived a few days; the clock struck one, and the next day he died. The following summer my daughters visited my brother, Dr. K. P. Watson, near Memphis, and took with them their youngest brother, Durell. He had always been a very healthy child, but was taken sick at my brother’s, and in a few hours died. The clock on the mantle in Arkansas struck once again, and in a few hours we received a dispatch that Durell was dead. The next autumn the clock struck again, and our Lillian, a babe of six months of age, passed away from us to join those who had gone before. One more case. My father died in that neighbourhood about twelve years since. Brother Coleman, the preacher on the Augusta circuit, lived that year on the place. There was about such a clock as is described by the Gazette. “It is of the old-fashioned, high kind, and has been stopped for years, not even having the weights attached,” but was packed away upstairs with some lumber ever since the death of my father. Brother Coleman’s’ child was sick, the clock struck ‘one,’ the child died soon after.